Can Energy Drinks Cause Plaque Build Up in the Heart? How Much Sugar is in Carrots? Soda pops, bread, beer and cheese are staples in the American household. Each of these products contains sugar. 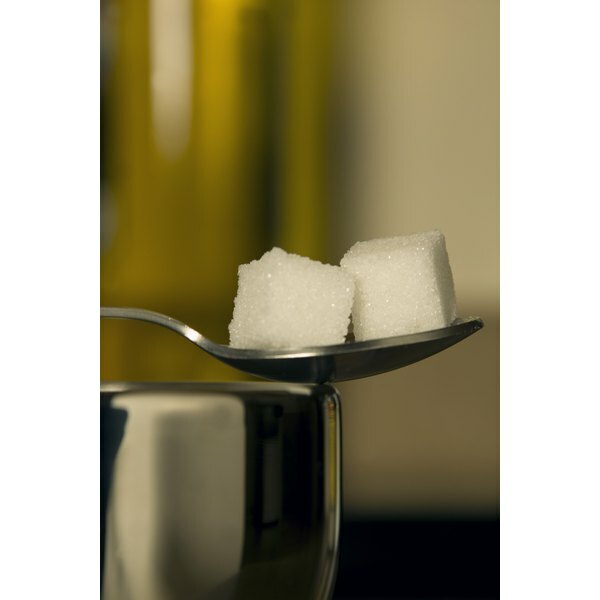 Sugar provides little nutritive value other than energy supply. The body requires this energy to carry out daily functioning. However, consuming excess of this staple heightens your blood sugar and adds to your fat reserves, potentially increasing your bad cholesterol and triglyceride levels. Low-density lipoproteins, or LDL, are known as carriers of bad cholesterol. These particles transport cholesterol away from the liver to the rest of the body. When high quantities of LDL cholesterol are in the bloodstream, deposits are left in the arteries and form plaque, which limits blood flow and oxygen. If a piece of plaque separates, this may cause a stroke or cardiac arrest. Food sources contributing to LDL cholesterol include saturated fats, such as fats in whole milk and butter, and trans fats, like fats in fried foods and packaged desserts. According to the Alabama Cooperative Extension System, your LDL cholesterol levels need to remain below 130 milligrams if you have no other risk factors. Sugar, also known as glucose, is a simple carbohydrate that contains approximately 16 calories per teaspoon. According to Colorado State University, the daily average sugar consumption for one individual is 25 teaspoons, or 400 calories. When these empty calories enter your bloodstream, your blood glucose levels, insulin and dietary glycemic load dramatically rises. Diets high in simple sugars are linked to hypertension, insulin resistance and inflammation. Sugar increases a certain fat in the blood known as triglycerides, according to the University of Southern California. Additionally, fructose, a derivative of sugar, is converted into fat by the liver, increasing your triglyceride levels. According to Emory University, high-sugar diets among teens decrease heart health later in life. In a 2011 study published in “Circulation,” teens consuming over 30 percent of their total energy consumption in sugar possessed lower good cholesterol, higher LDL cholesterol and higher triglyceride levels than their counterparts consuming low quantities of sugar. Additionally, overweight teens consuming high levels of sugar displayed more symptoms of insulin resistance. Limiting your intake of sugar lowers your LDL cholesterol levels, reduces your triglycerides and helps you achieve weight loss, according to the Alabama Cooperative Extension System. Low-fiber, high-sugar diets are linked to increased triglyceride levels and reduced high-density lipoprotein cholesterol, or good cholesterol. High-fiber diets may contribute to lowering LDL cholesterol and stabilizing blood sugar levels, according to Linus Pauling Institute. Specifically, consuming viscous dietary fiber, or fiber found in oatmeal, lentils, beans and peas, decreases overall serum cholesterol and LDL cholesterol. Suzanne Allen has been writing since 2004, with work published in "Eating for Longevity" and "Journal of Health Psychology." She is a certified group wellness instructor and personal trainer. Allen holds a Bachelor of Arts in communication and information sciences, a Bachelor of Arts in psychology and a Master of Arts in clinical psychology. How Does Sugar Affect Your Body Badly? Does Drinking Water Bring High Glucose Levels Down?